Blogspot users won’t stop asking how to create a download website on Blogger platform Knowing well that blogger does not support users to upload files directly. Blogspot Host is totally free and there’s no way they could have given you the option to host your heavy files there. that will consume a whole lot of space from their end and the maintenance cost will every day increase, that’s why they can’t allow you to upload free. Maybe When Blogspot upgrade to premium plan they might consider adding the file hosting option. But does that really mean you cannot Create a download website using Blogspot host? Not really. You can create one but you won’t be uploading the files directly on Blogger.com. In this article, I will show you how to go about Creating a download website on Blogger. This will definitely help those who are planning to start Music, Video or apps download websites using Blogger host. Apart from the fact that Blogspot is more easy in terms of setup and management, You won’t need to pay any monthly or yearly fee to get your site running. It’s a good idea starting your website like a professional perhaps using WordPress and doing everything the real method but that’s only when you can afford it. though it’s not expensive, just that so many bloggers are starting up with zero capital. If you are not financially buoyant and you start a music/download blog using WordPress, in a few months time you will be off blogging because your available resources will be exhausted. Starting a download website using WordPress won’t be an easy task unless you got the money. If you want to start a download website where you upload everything directly, for starters you can be spending like 6,000 Naira monthly for hosting and the worse is that you won’t be earning anything at this point because blogging is not a get rich scheme. Since many new bloggers cannot afford the cost of starting up download website from WordPress, They are questing other alternatives in order to minimize the expenditures to meet their available capital. And the best way to do this is using Blogspot host (which is totally free). Like you already know creating a Blogspot site is as easy as ABC. If you haven’t learned you can read my article here. You can also read how to buy a domain name in Nigeria here. Now let assume you have created your Blogspot site and you have connected a paid domain name if at all you want to use a premium domain. But the question remains “How to get people to download from your site” Since your aim is making a download website. There are two ways you can archive this: Using Authority links and Uploading your own files. Let’s assume I want to update my blogger site with trending music so that people can download from my blogger site, here’s what I will do using authority Download links. You can then select any top and reliable website where you would want to get your download link from. I just clicked on the circled website above. 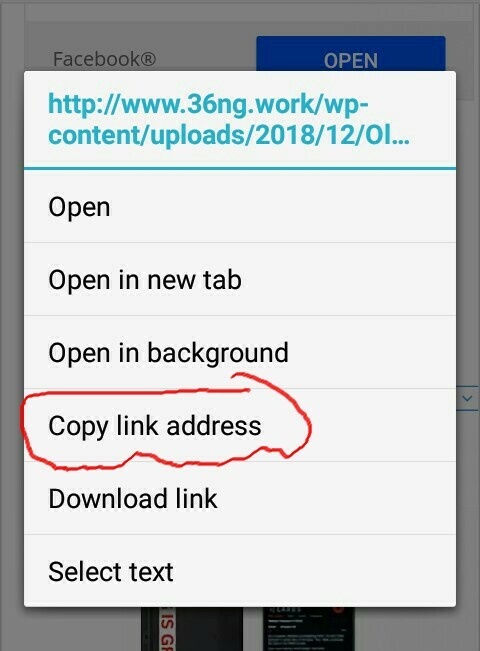 Scroll down to the download section of the website and click and hold on the download link then copy the download link to your clipboard. 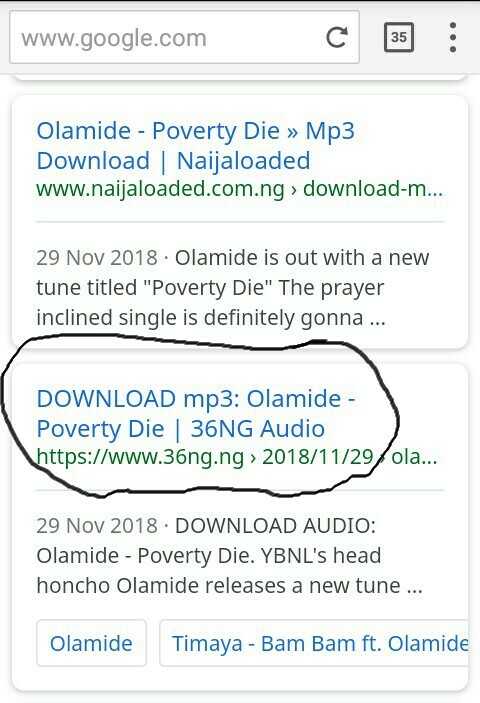 When you visit the page https://www.36ng.ng/2018/11/29/olamide-poverty-die/ and click on the download button it will start downloading on your device but since we don’t want to download it you will only need to copy the download link as explained above. If you copy the download link below is what you will get. Just take that to your post which you want to upload on your blogger site and do something as shown below. After publishing your post, When your readers click on download here, it will start downloading immediately without leaving your site and they won’t know the website where the music is uploaded because you have used a URL shortener to mask that. This method is applicable to both music, Videos, Apps and every other thing Downloadable. Always be sure that the websites you’re getting your download links from are authority websites because if anything happens to those websites your download links will stop working. I don’t really think this idea is better of the first one but I need to show you just in case you want to explore something different. This means you will have the files in your device before uploading. All you need to do is upload your files via Google Drive and you will get your direct download links. Then you can use the link on your website as your file download link. You will have access to all your files but that will be more stressful. I will recommend you go with the first method. You can also use the above methods in WordPress if you think your hosting plan is too small to handle the entire files you want to upload. With the above method, you will be getting your download links easily without uploading while your site continue running on WordPress. Did you find the above article regarding how to create a download website on Blogger platform helpful? Why not share with others who are willing to learn? Before you exit this page, kindly subscribe to our newsletter for more updates. Bro thanks for this you’re good !! Really good! Google Drive is the best place to upload files. Thanks for the update. This is nice article Prosper! You are such a wonderful blogger. But during my search, I found two methods easier and more fascinating. As a blogspot user, you can have your visitors play the song before they download and one of the methods shows numbers of download. WITHOUT USING THIRD PARTY DOWNLOAD LINK. And you can check the demos on my blog (Memonaija).